When Nike Adapt BB 'smart shoes' were announced, we must admit we groaned slightly and thought, "Oh great, another way to count steps." But this is something very different. More akin to what we think Samsung's SmartShoes will be like, they're aimed at pro athletes, but with a look and futuristic cutting edge that could see them rule the streets as well as sporting venues. Why? Because as well as its technical excellence and usefulness to professional basketball players looking to improve their 'hang time', Nike Adapt BB is also a self-lacing trainer just like in Back to the Future! Nike, it must be said, is at pains not to mention BttF, as this is meant to be a serious pair of shoes. Adapt BB is all about a perfect, customised fit. It just happens to achieve that via a self-lacing shoe, like in Back to the Future. The system used is called FitAdapt, and it involves an app, a motor and wires that draw the shoe tight (or loose, if you prefer) around your foot. To achieve a perfect and adaptable fit, Nike has replaced the traditional shoelace, which 'dates back to 3500BC,' according to Michael Donaghu, Nike’s VP of Innovation, with FitAdapt. The precise snugness can be modified via Nike's Adapt app or the buttons in the midsole. At present it's possible to relax the fit 'during a time out', then have it pull tight around your foot as you resume hoop-dunking activities. Nike suggests that with further firmware updates it will be possible make further modifications to the fit, to suit different phases of a game. The shoe is the 'most tested in Nike history', with thousands of hours of testing for resistance to impact, water and heat. Michael Donaghu, Nike’s VP of Innovation, is bullish about this melding of tech and footwear. 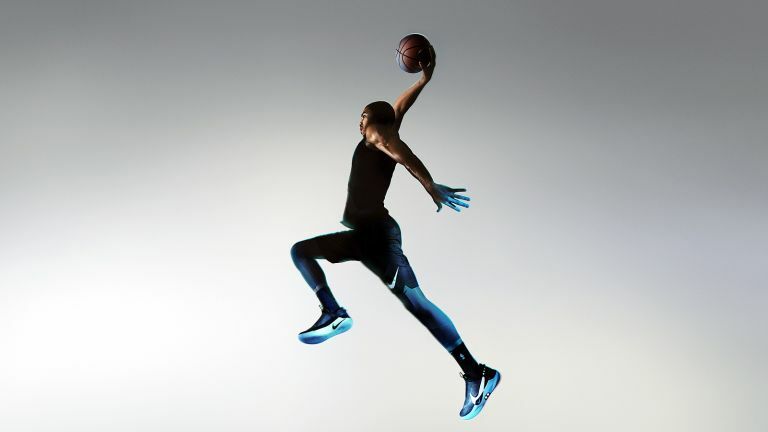 'Our long-term vision for innovation at Nike is a world in which intelligent products adapt at the speed of sport to improve an athlete’s performance,' he says. 'We’ve finally added firmware to footwear, letting us continuously improve the product you’ve already bought, responding as need be to changing preferences and environments. However, before we go too far back to the future, let's accept that at the moment, BB Adapt is 'only' a self-lacing shoe. It's actually quite surprising that, although Nike's high-tech (not Hi-Tec) new shoes are battery powered and festooned with electronics, the brand has so far resisted the urge to include any means of gathering movement and speed data and all that jazz. Perhaps that's down to hared-won experience; the brand tried all that with Nike+, many moons ago. How long ago? Well, have a look on Nike+'s Wikipedia page and you'll find a reference to one especially choice feature: 'pre-recorded congratulations provided by Lance Armstrong, Tiger Woods, Joan Benoit Samuelson, and Paula Radcliffe whenever a user achieves a personal best.' Ah, those were the days.